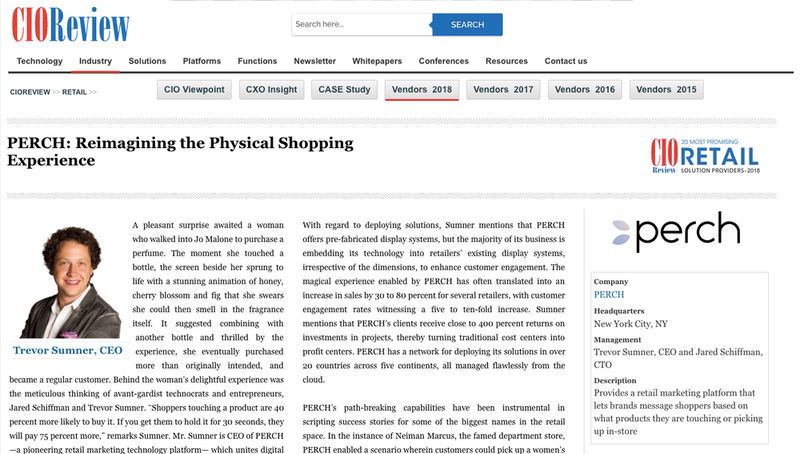 PERCH pioneered the art of replacing conventional display screens with digital displays that seamlessly fit into any retail environment and sense consumer behaviors. “Our interactive retail displays use 3D camera sensing technology to detect when customers approach, touch, or pick up a product, to launch a new digital experience,” mentions CTO and company founder, Jared Schiffman. Each unit contains embedded 4G Wi-Fi hotspot that simplifies the installation process to connect with PERCH’s cloud-based server, leaving no room for breach of personally identifiable information. Accompanying the camera and display is a robust campaign management system that simplifies the creation of rich media and interactive product campaigns that unlock product-level marketing in otherwise crowded retail environments where brands can easily get lost. Campaigns for new products can be created and deployed effortlessly, while the displays track every customer interaction and the ROI is tied to product sales lift.